A couple of weeks ago we went to Uretiti for four days and fished our ShoreThing Kontiki Dropper Rig in front of the camp every day. During our stay we had a mate fishing alongside us for a few sets, he was using a conventional Seahorse Kontiki rig. At first he was using squid bait and I was using fresh mullet, but he soon changed to fresh mullet when he saw the I was consistently getting of five or six, 3kg to 7.5kg snapper per set while he was having little success. The conditions were atrocious for any kind of fishing. A 30 knot easterly was blowing straight in and the swell and chop relentlessly pounded the ShoreThing rig as it was setting. A full set was only giving me around 1000 meter sets, while in calmer conditions I can easily get 2000 meters out. 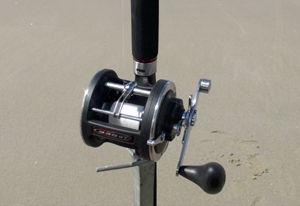 Once out there the rough seas pounded the ShoreThing Rig over the entire time it was set but the 60 ounces of lead on the hook section successfully anchored the gear for the duration of the sets. Unlike my old conventional kontiki rig, main-line drift after the motor cuts out has never been an issue for me since I switched to the ShoreThing rig. You will see by the photo above that the sea conditions were not good, we had a Easterly of 30 knots and more blowing straight in. Despite changing baits, my mate with the conventional kontiki rig still struggled. We would set the two rigs out at the same time and they had the same baits, but his catches were nowhere near as good as mine. His main issue was getting the gear out straight, and when he did, mainline drift was dragging his gear back to the beach. He had a few sets where he caught one fish and others with no catch at all while I was getting great hauls of big snapper every time. I have set my ShoreThing around 60 times now, compared to my old kontiki rig I'm convinced I am catching more and bigger fish and I am doing so more consistently and in a greater range of sea conditions than I ever did with the old kontiki system! I put this down to the fact that the hook section is really well weighted and lays hard on the bottom, the baits are delivered in tip top condition right to the desired setting spot, and the gear is securely anchored for the duration of the set. I use a 46lb thrust auto-pilot Seahorse Kontiki to tow the ShoreThing and I reckon this combination really is the ultimate kontiki system available anywhere. Barbara Osborne recently purchased a complete Pocket Sled Kite Rig from us and I went to Uretiti with her to show her the ropes. The rig she purchased included the rod and level wind reel, two Pocket Sled Kites (one for strong winds and one for light to moderate conditions), two drogues and bridles for the kites and all of the kiteline, dropline and hook section on a handspool. Barbara's rig also included a trace rack with 10 floating bead traces with target hooks and line weights, this provided ample terminal tackle and ensures the hook section is held on the seabed. 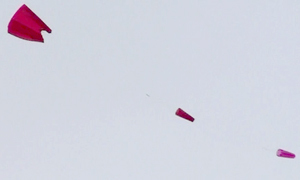 As the winds were strong we put the smaller pocket sled kite on and used two drogues. To do this you pass the clip on the end of the back drogue cord through the hole in the second drogue and clip it to a loop tied just above the four stay ropes of the second drogue. The use of both drogues in a train allows the kite to remain stable in very strong winds. 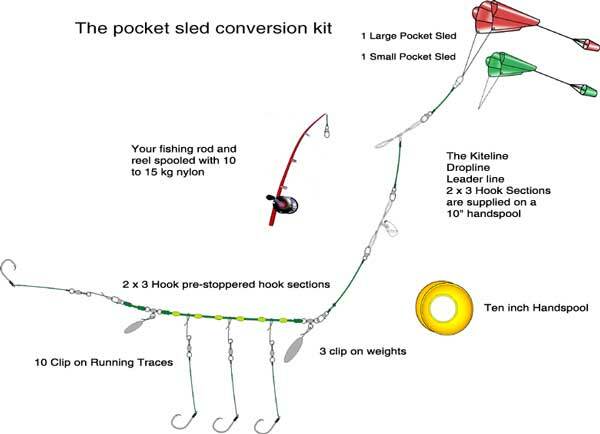 If you already have a rod and reel with 10kg to 15kg line and can make up the other fishing lines the Pocket Sled Kites Only can be purchased separately. You will have to watch the video above to see how excited Barbara was when the gear came back in with a nice sized snapper attached. 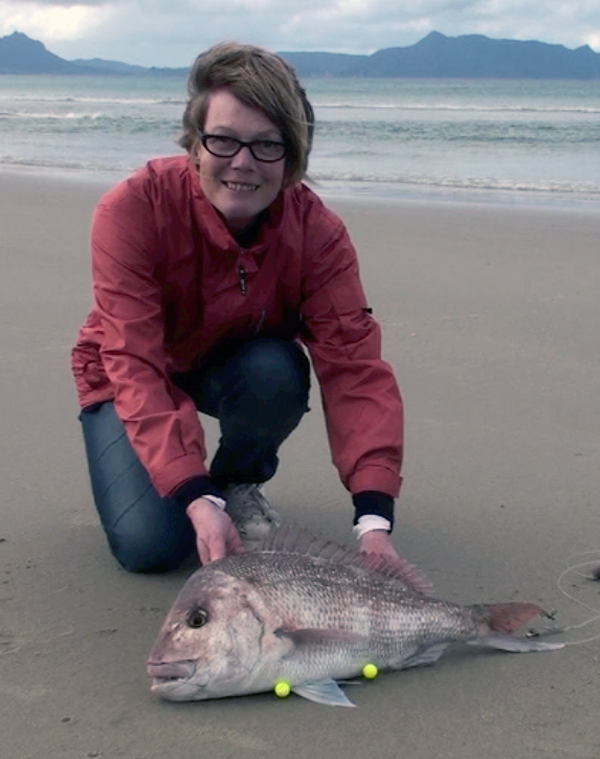 Later that week she told me with a big grin on her face that while walking her dog on the beach she watched a 25 hook kontiki longline rig being hauled in right where she had fished, the couple fishing only caught one snapper, and it wasn't as big as hers! I think she is hooked! Barbara just couldn't have been more excited about catching such a good fish on her first try. Below is a diagram of the rig Barbara used. Check out Other rigging options for kitefishing from a rod and reel for more ideas on how to rig kites for trolling and reef fishing. On the same weekend that Denis fished the east coast we did a ShoreThing Kontiki Dropper Rig Demonstration at the top end of Muriwai Beach. As everyone using a kite or kontiki was fishing over the top of the tide, the spots where you could safely park were crowded and the rigs were a bit too close together. Just up the beach from us a family were using toy kites, (they had cartoon bumblebees and dragonflies printed all over them! ), on a 10 hook dropper rig they had put together. The wind was less than 20 knots for most of the day and this was the limit of what their kites could handle. When a gust hit their kite it would tack wildly or spin or dive so I figured I needed to allow plenty of room on that side when I set. 500 meters down the beach was another family fishing with one of our big Kite Dropper Rigs with a Nighthawk Kite and Skyhook providing the power. Their kites were flying true and holding the gear perfectly straight out. I set the auto-pilot on our Kontiki ShoreThing rig to aim at a position down the beach nearer to the big dropper rig but well behind it. Our first set caught half a dozen fish, the biggest was a snapper around 3kg. 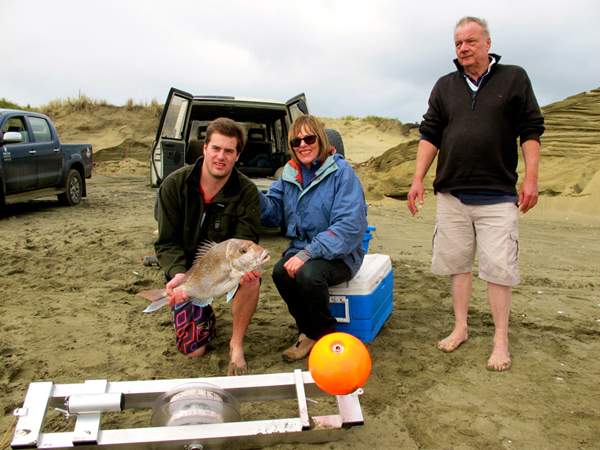 From Left: Demo attendees Sam and his Mum Pip with a snapper taken on the ShoreThng, I am on the right. 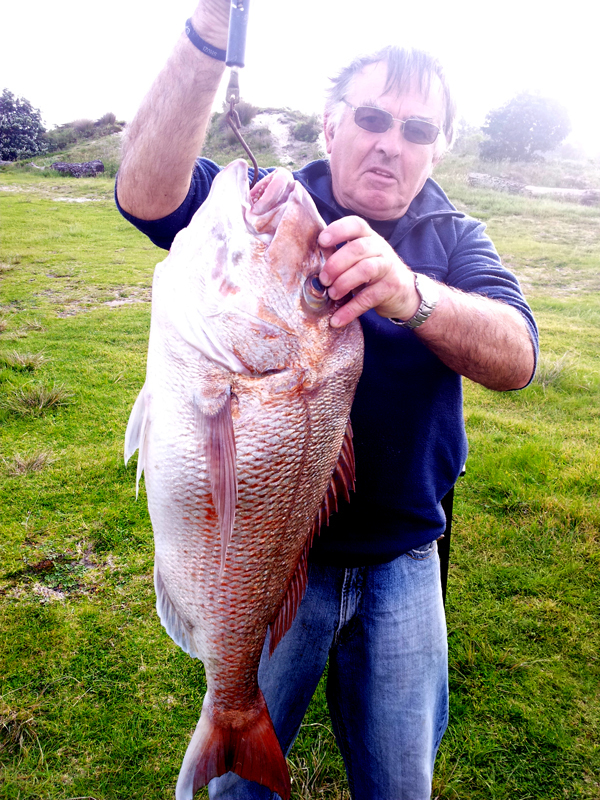 In the meantime the group with the toy kites hauled their gear in and landed a very nice 7.5kg snapper and a couple of gurnard. As they were re-setting their gear the kite nose-dived and was broken, they replaced it with another completely different type of toy kite which was even more erratic than the first and it had a huge bias to the left. This was bad for us as it closed the gap we could fish in. Then I made a bad decision, I reset our auto-pilot further to the left which put us closer to the big dropper rig down the beach and we set again. It looked like we had got away with it but during recovery we realised we hadn't. The guy with the big dropper rig had caught a large sevengill shark which had dragged his hook section around our dropline. We were lucky as it was just our dropline straight through the tangle so I cut it and re-tied it out of the tangle so we could continue recovering our hook section. The other guys gear was a real mess and I felt pretty bad about settig to close to him, so I told him we would give him a new hook section next time he calls into the shop. The real irony is that the second toy kite crashed early in the set and that was the end of their fishing for the day. This meant I didn't need to alter the course on our kontiki and could have avoided the tangle altogether. 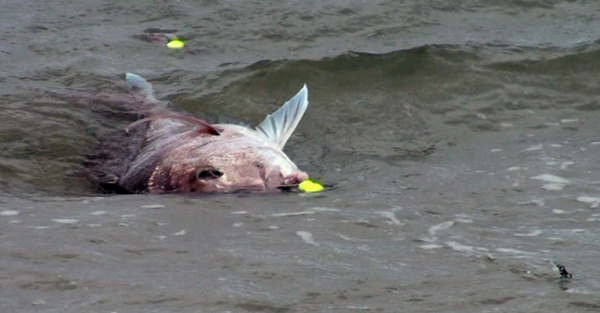 The lesson is clear, don't fish too close to other kite and kontiki fishers! 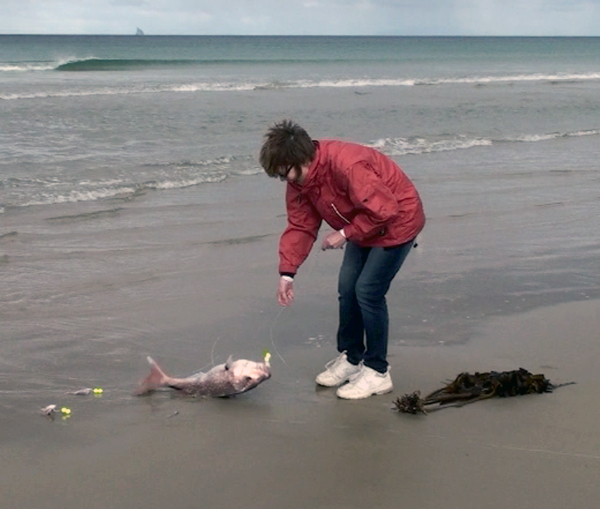 Throughout the day we spoke to a few fishers going up and down the beach, everyone who got any sort of kontiki or kite rig out had caught good fish. 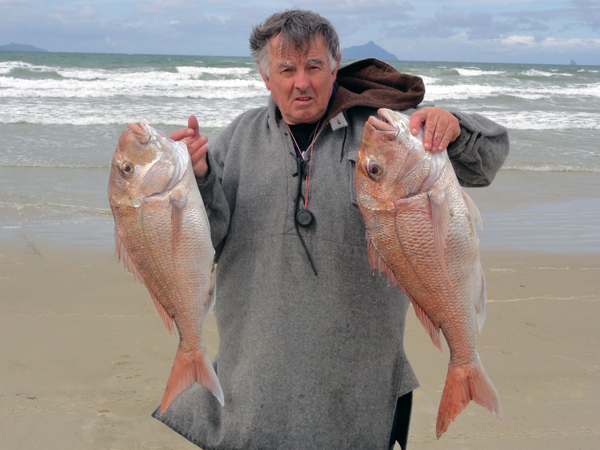 Five snapper between 7.5 and 10kg were caught from two or three kilometers of beach along with heaps of smaller snapper, gurnard and kahawai. One kontiki fisher had two 20 pounders in his fish bin, but the sharks had bitten through his hook section and he lost his kontiki on his last set. Using kontiki longlines without a ShoreThing is certainly a very risky proposition on the west coast! We caught a few smaller fish on our second set, bringing our total to 10 snapper and a couple of gurnard for the day. Everyone who attended the demo had a great time and got to take a few fish home with them.